Is there any way for medical services to be provided more quickly at disaster sites? The towering tornado that struck Hattiesburg, Mississippi, in 2013 ripped roofs off houses, twisted steel girders as though they were Play-Doh, obliterated buildings, and tossed cars through the air like toys. It barreled down Hardy Street “like a bowling ball,” said Dr. Italo Subbarao. In the aftermath of the twister, Subbarao, an associate dean and disaster medicine specialist at the William Carey University College of Osteopathic Medicine in Hattiesburg, sent his students out to study how quickly emergency medical teams had responded to the disaster. 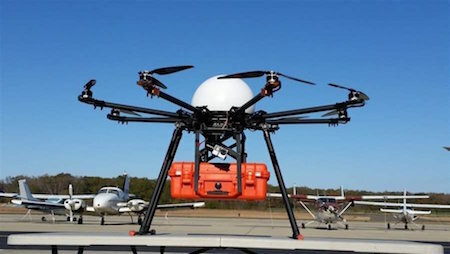 By combining the two technologies, drones and telemedicine, a doctor miles away could instruct a layman at the scene in how to provide rudimentary, but perhaps life-saving, medical care. Subbarao’s project, which he began the year after the Hattiesburg tornado, has now produced three prototypes and conducted several demonstration flights. It appears to be the most advanced attempt to equip a drone with audiovisual equipment so doctors and survivors can interact in an emergency.